What Kind Of Issues Can a Chiropractor Help Me With? You are here: Home / Treatments / Chiropractic Care / What Kind Of Issues Can A Chiropractor Help Me With? A good number of people assume that chiropractors are only there to help with our back and neck pains. While this is true, there is so much more that a chiropractor can help with in terms of getting rid of aches and pains; even those that don’t originate from the back or neck. Below are some of the ways that a chiropractor can be helpful to you. Chiropractors know how to manipulate the sacroiliac joint that links the lowest part of your spine to the pelvis. When this is done you get instant relief in your lower back. Some certified chiropractors can even perform a technique called Active Release Technique (ART) to eliminate scar tissue from muscles thus relieving pain. Most pregnant women experience all kinds of pain. A good number of women suffer from lower back pain and sciatica which are a result of improperly aligned pelvis. Because pregnant women should not take medication as it can reach the unborn baby, many opt to seek help from a chiropractor. The nerves contained in the abdominal and chest (thoracic region) of our spine are associated with digestion. Herniated discs can cause stomach issues but when the thoracic vertebrae is not properly aligned it can cause digestion issues too. This is because nerves start sending irregular impulses to the intestines and stomach thus leading to issues such as bloating and heartburn. By keeping the thoracic spine properly aligned, you can realize better digestion. When your upper back and neck are the cause of your headache, a chiropractor might be just the thing you need to help. By employing manipulation massages to loosen up your muscles, they ultimately relive your headache. There is need for more research but some independent studies indicated that chiropractic treatment can be instrumental in alleviating pain from individuals who suffer from chronic headaches. If you’re from around the Cary NC region, then Preston Chiropractic & Acupuncture is the best place to get your massage. 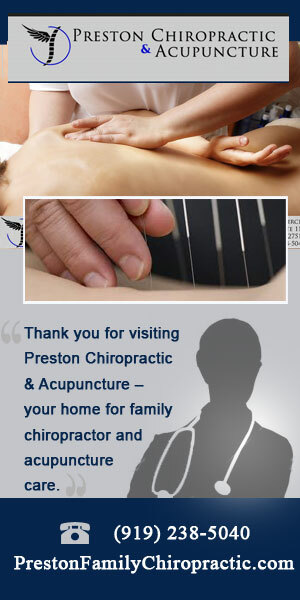 They have been providing chiropractic services for over eleven years and they never disappoint. Their chiropractic therapies are safe for all ages and this makes it ideal for treating families. Other than massage therapy they also offer acupuncture and medical massages to people of all ages. Because Preston Chiropractic values quality in all the services they deliver, their staff is personable, friendly and genuinely cares about each patient’s well-being. Whether you’re seeking the services from Cary NC, Raleigh, Morrisville, Durham, Holly Springs and Apex, you are guaranteed the best services you could ever hope for. All the chiropractors are also fully licensed with impressive credentials which include an education from Sherman College of Chiropractic which is one of the most prestigious Colleges in the USA. Check out their site and look through the list of Doctors you’re likely to receive care from. You can also contact them through the site to book an appointment or ask questions. For more information on chiropractic care or to schedule an evaluation contact Preston Chiropractic & Acupuncture at 919-238-5040.